The exact start time depends on the weather and sea conditions. We usually meet around 9:00 a.m. The minimum age to join these lessons is 10. What to bring: Swimsuit, towel, sun protection, snacks. This experience is available year-round, with the water temperature between 15º to 17º in the winter and 20º to 24º in the summer. We provide winter wetsuits November-April, and summer wetsuits May-October. Our instructors are certified by the Portuguese Surfing Federation. Finding the perfect waves for the perfect surfing day is a lot easier when you've got a local with you. And it's a lot more fun when that local is a surfing instructor passionate about the sport and his home. With this day tour, you'll be in good hands with one of Sao Miguel's best surf guides. Before the tour begins, your instructor checks the conditions of the most popular beaches, fully preparing for whatever your needs are. After your pickup, he chats with you to make sure he understands your expectations, your experience, and if you'd like to spend time at multiple beaches to see more of the area. He then drives you to a beach best suited for you and provides all necessary equipment. As you practice new surfing techniques and tricks, your instructor happily answers any questions you may have about the island. 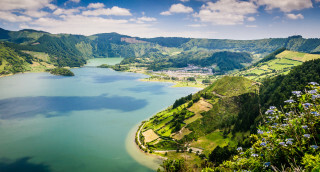 Curious why Sao Miguel is known as the "Green Island"? How the endless fields, green valleys, and thick woods of the island evolved? 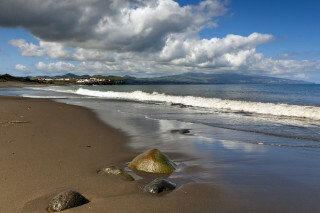 As a quick break between surfing, you can also decide to hop in the car and see some panoramic views! For the full ten hours, you can choose to take your surfing to intense new levels, or just play around with what you already know. Although you are with a guide, this day is ultimately all yours. You know what you're looking for - our instructor just helps you find it. A full day of surfing is difficult without a good meal. Perhaps you'd like a plate of delicious Azorean cod, or something traditional like the meaty Cozido das Furnas dish. Whatever you're craving, your instructor will guide you in the right direction. Then it's back to the water for more bottom turns and cutbacks! 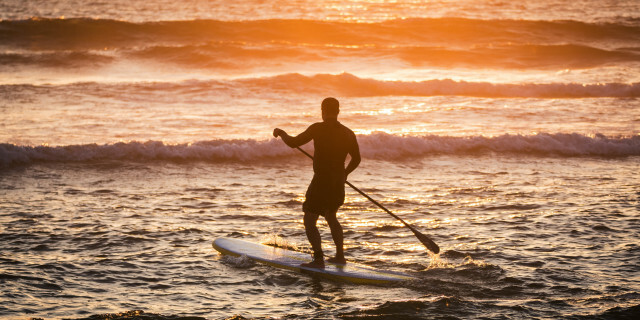 Your instructor drops you back at the hotel with some last recommendations about what you can visit, and tips on how to improve your surfing skills. After a day in the sparkling waves of the island sea, you realize Sao Miguel feels a lot more familiar than it did that morning.